When organizers began planning for an international gathering of youth climate activists, they never imagined it taking place in the midst of a popular uprising. 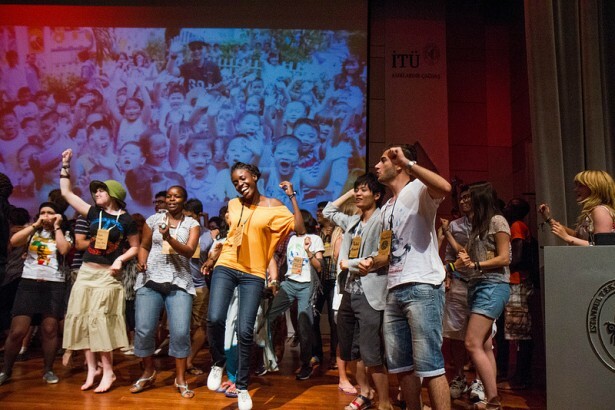 It’s an auspicious time for 500 young climate activists from around the world to be gathering in Istanbul. Just a few weeks ago, an effort to save the city’s Taksim Square and Gezi Park (one the last green spaces in the city center) from development sparked a full fledged people-powered movement across the country. When 350.org and our allies envisioned convening this broad movement convergence two years ago, we never could have imagined that we would be holding this event in the midst of a popular uprising. Still, it feels appropriate (if a bit surreal). After all, this Global Power Shift convergence is aimed at helping catalyze a new phase of an international climate movement that will be able to put on such a massive and sustained show of force that it disrupts the status quo and captures the public imagination. Just like the Taksim Square activists have done. 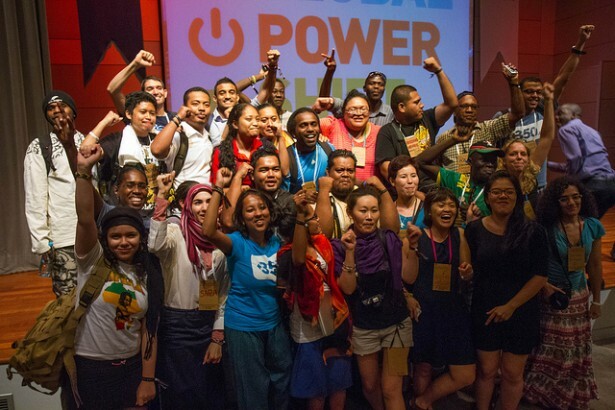 It’s no exaggeration to say that this is an historic meeting: Global Power Shift marks the first international gathering organized by young climate activists, for young climate activists, that has taken place outside of the United Nations climate negotiations. As organizers from Bolivia to Argentina shared stories in Rio, we brainstormed an idea that had been percolating within 350.org for a while: creating a truly international youth convergence outside the U.N. process that could serve as a space for aligning strategies, sharing ideas, and building concrete skills to wage and win campaigns to halt greenhouse gas emissions. Young people aren’t waiting for governments to catch up — they’re taking the lead and organizing their own communities. And now here we are, in Istanbul. We kicked off our opening night with cultural performances from peoples all over the world — it was breathtaking to feel the thunder of youth shake the plenary hall. Mikaele Maiava shared a story about his community in Tokelau fighting to maintain traditional ways of living in the face of rising sea levels that threaten land-based peoples around the world. The Global Power Shift Pacific team offered us a traditional Haka warrior dance, and connected stories from islands around the Pacific (here is a video the team debuted at the convergence, which captures some of their energy). The 500 young activists in Turkey this week are working together to navigate a common challenge we all confront in the course of our climate justice organizing, no matter where we come from: How to balance breadth and depth as we work in our communities. That is, how do we organize with the millions of people needed to address the scale of the climate crisis, and do so in a way that is rooted, transformational, and engages us in our own hope and humanity? How can we navigate the psychological burden of this generational challenge? And how can we successfully confront an adversary as powerful as the fossil fuel industry? To help navigate those questions, we recruited a remarkable international facilitation team that designed a unique curriculum that meets the varied needs of young people from more than 135 countries. We have a geographically diverse “Listening Team,” with skill sets around cross-cultural dialogue and mediation in order to be responsive to participant needs. Workshops will include week-long sessions on “hard skills” like grassroots campaigning, policy advocacy, nonviolent direct action and civil disobedience coordination, creative arts, digital innovation, and media outreach. During the course of the week we hope to foster an understanding that movements in different places have different needs and circumstances, but can also work together in shared frameworks to build a movement that is greater than the sum of its parts. Together we can build synergy to face a common foe — the fossil fuel industry — and create a shared vision of local clean energy solutions that takes power away from corporations and puts it in the hands of people. It isn’t easy. We are inheriting all sorts of old divisions of power built by the generations before us: economics, race, colonial legacies, gender and many more. One manifestation of this is language — English is the “language of empire” that these sorts of international convenings are conducted in. Without the resources to simultaneously translate to dozens of languages, our entire convergence is proactively grappling with creative facilitation techniques to make the conversation accessible to those who speak English as a learned language. Every day, participants self-organize and make plans in regional groups, some of which are facilitated in different languages. The effort to democratize communication is itself a mirror of our work here — it’s messy and imperfect, but it’s an honest attempt at overcoming the barriers that separate us and gives us the skills we need to genuinely collaborate and empathize with one another. Trainings like this don’t just teach us how to be skilled in activism — they also teach us to be better people. I was struck by a comment a participant made after our opening night – “we all belong here because we are all different. Yes, we all belong here.” This is a new stage of our movements’ growth. The gathering in Istanbul is just Phase One of a multi-year plan to challenge the power of the fossil fuel industry and demand climate sanity. While 500 young people are here in Turkey, more than 5,000 others have committed to participating in Phase Two. The second stage has three central goals: directly targeting the fossil fuel industry and its dangerous business model; connecting the dots between extreme weather events and global climate change while also creating community resilience to weather disasters; and building local, community-controlled renewable energy systems. We will kick off this second stage with at least 70 national and regional convergences and summits taking place over the next 18 months. The world will witness a new wave of events and mobilizations that embody the renewed spirit of our evolving movements. 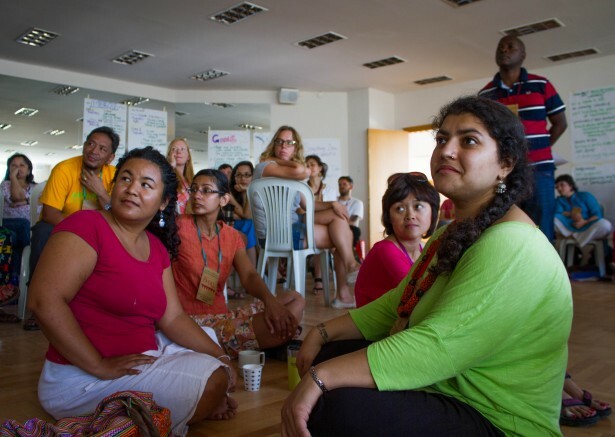 The mobilizations will look different in different places, reflecting local needs and leadership, but will share the culture collectively built here at Global Power Shift. A community of more than 45 organizational partners will spearhead the upcoming mobilizations. Partners include The Global Campaign to Demand Climate Justice (a network of more than 250 frontline community groups, mostly from the Global South), Jubilee South, Greenpeace and Friends of the Earth International. These groups and others are offering support and coaching for youth back in their home countries. Additionally, we will be working with Global Greengrants to administer small grants for each summit, with an emphasis on supporting youth to do their own fundraising to help them develop autonomous financial capacity so our movements can resource themselves and reshape the landscape of nonprofit funding models. We see Global Power Shift and its follow-up as a proactive response to the situation the global climate movement found itself in after 2009. Four years ago, there was tremendous focus on passing comprehensive climate legislation in the United States and also on creating a new binding global treaty to slash greenhouse gas emissions. As we all know, those efforts ended in disappointment. Those goals were important — and continue to be — but a main lesson for the movement was that it lacked the national political power to hold politicians accountable. The movement learned from groups organizing in directly-affected areas that we do have power — the power of our own communities. During the last several years, local community-based organizing has kept more carbon in the ground than any other effort. With Global Power Shift, the current generation of activists is leapfrogging that stage into a place of more sustainable and skilled leadership. Maybe — just maybe — these and other efforts will also shape a new political paradigm going into the next wave of international climate negotiations in Paris in 2015. Meanwhile, the situation here in Istanbul offers one hopeful example of how citizen protests can disrupt the status quo in just a short amount of time. Many of Global Power Shift’s Turkish organizers are closely involved in the protests here, and they say the street mobilizations have renewed the spirit of Turkish civil society. Last week, for example, the governor of Istanbul called on the parents of young people occupying Gezi Park to get their kids and bring them home. Instead, mothers came out en masse, encircling the park to protect their children from police. Mothers brought mixtures to heal tear gas-burned eyes and other supplies. It’s a wonderful real-time lesson in popular mobilization, and it’s just what we need in the global climate justice movement: Widespread, cross-generational solidarity that can stand up to the structures of power and put in place the new systems we need to survive and thrive on this planet. One of our panels today was entitled “a movement of movements”: with stories from Idle No More’s indigenous resistance in Canada, the Indignados in Spain, the Arab Spring in Egypt, uprisings in Brazil, Occupy Wall Street, and of course, the Turkish uprisings. We’re making connections. The problems that caused climate change separated us. We believe that coming together to solve a global problem can set the world right. Climate change isn’t just the biggest problem humanity has ever faced, it’s also our biggest opportunity to rethink the way we live, rethink our economic system, and rethink the way we treat each other and the planet. In fact, we will have to have these new systems in place in order to survive on this planet. This article appears through a collaboration with Earth Island Journal and was jointly published there. Joshua Kahn Russell has trained thousands of young activists in nonviolence, civil disobedience and campaign strategy. He is an organizer and trainer for 350.org and the Program Manager for Global Power Shift. For the last two years he has been focused on fighting the Keystone XL Pipeline. What a wonderful time to be young and able to conceive of making a difference not only in local communities but also in our nations and in our world. I am 74yrs old and not very able but I remember the hope we had after the 2nd world war of a better world but as teenagers we never felt we had any power to change things. Now I see a generation organising, coming together with determination and purpose, and I rejoice! I am following your progress with interest and wish you success in all your undertakings. anyone else getting similar RSS issues? Anyone that knows the answer can you kindly respond?